Super Eagles attacker, Moses Simon has been ruled out of the 2018 World Cup following an injury he sustained while playing for his club. Simon, who plays for Belgian Jupiler League side, Gent, will not feature in today’s friendly against the Democratic Republic of Congo, DRC, nor the subsequent game against England on June 2. 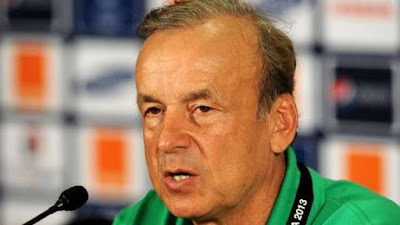 Super Eagles’ Manager, Gernot Rohr confirmed the development to news reports in Port Harcourt. He said, “It is unfortunate Moses Simon will not be travelling with the team on Tuesday because he is down with an injury. Rohr is set to drop four more players from the squad after the game against DR Congo. Today’s match against the Simba of Democratic Republic of Congo at the Adokiye Amiesimaka Stadium represents the last opportunity for Nigerian football fans to cheer the Super Eagles at home before this summer’s FIFA World Cup finals.